My second car was titled “Great White” and was a 3D print of Mr. Jaws. I ended up kicking out some quick axle mounts in OpenSCAD and just hot gluing them to the bottom of Mr. Jaws. They probably weren’t on straight, but I didn’t take the time to care. 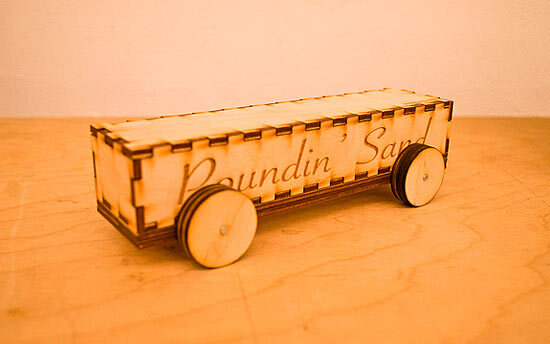 In the category of 3D printed cars… I still came in second! 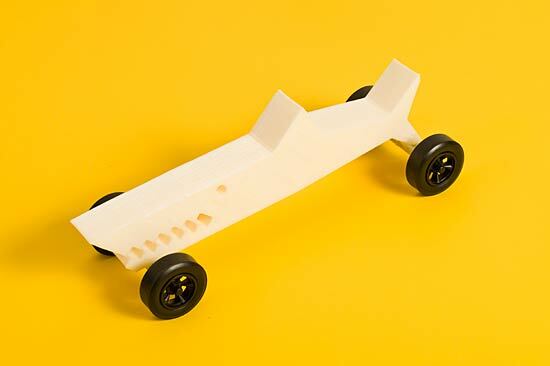 Ed managed to build an amazing 3D printed car, and the worst (best?) part is, he pretty much had the same idea as I did, but he managed to succeed. (Print time and print failure were the two biggest concerns for both of us.) I ended up using stock wheels instead of the 3D printed wheels I made a few weeks earlier, which seems silly as I could have gone for a full-on 3D printed car… oh well. My third car was the RasterMobile! 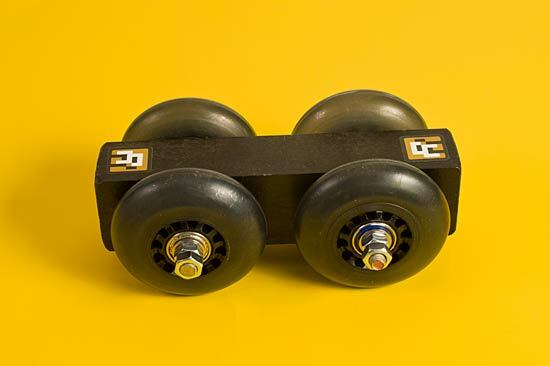 which actually consisted of a block of wood from a real Pinewood Derby kit, turned sideways, with two holes drilled all the way through, and 5/16″ threaded rod with inline skate wheels attached. I had skate bearings that seemed to turn well, I had some weight and mass, and it was painted black with RasterWeb! stickers on it. What could go wrong!? So how did my cars do? I didn’t expect much out of Great White, as it was really light, and the wheels were probably not completely straight. It rolled down the track, so that’s all I can report on that one. I still think it looked cool and was a neat idea. The RasterMobile! didn’t do as well as I expected. I thought it would fly down the track, and I suppose it did, but the mass of it probably slowed things down too much at the bottom. I did get a some satisfaction that Gary saw the skate wheels, ran to his car and ripped apart his inline skates just to try to beat me with my own idea. :) Oh, the RasterMobile! also had an accident where it jumped out of its lane, so that certainly didn’t help things. So which car did the best? Surprisingly it was Poundin’ Sand that performed the best out of my three cars. I wasn’t sure the laser-cut wheels would be up to the task, and I questioned whether not gluing the 3 layers that comprised each wheel together was a good idea or not, but it did alright!